What I call a "mixed screening border" is a lot like a hedgerow. Hedgerows divide up farmers fields, and often consist of the "native" trees and shrubs that would be there if the fields weren't cultivated. Whatever you call them, this type of planting can provide vital resources for mammals, birds and insects. I like to think of them as hedgerows - it reminds me of Winnie the Pooh. As well as being important habitats in their own right, hedgerows can act as wildlife corridors. They break the wind, attract beneficial insects and reduce pests. They provide privacy screens and reduce noise. Hedgerows can provide fruit, berries and nuts. They replace weeds or rows of arborvitae. Hedgerows help to hold water and reduce erosion. Hedgerows are a place where you can leave plant litter on the ground to provide valuable habitat for many invertebrates (who will in turn attract predators such as birds and bats) and cover for small mammals. In addition to all that, hedgerows are also beautiful. The more diverse in composition a hedgerow is the more species it is likely to support due to a diversity of flowering and fruiting times. There are quite a number of viburnums that can become part of your hedgerow. They have spring flowers, berries, beautiful fall color and most of them won’t outgrow the space. They do fine in part-shade (some even in deep shade). And berry set is best when several are planted near each other. You can have red, yellow, black or pink berries. Plant the fragrant varieties at the front or nearer the house so that you can smell the delicious fragrance wafting over you in spring. Here are some viburnums that I've found to be interesting and "sturdy". Viburnum dilatatum (Linden Viburnum) not only has wonderful fruiting in fall, but has some of the best foliage of any viburnum - large leaves, wrinkled and glossy, look great all summer, and they turn burgundy shades in fall. White flowers in June are followed by clusters of red or yellow berries which persist into winter. Two different V. dilatatum selections must be planted for berry set. V. dilatatum 'Michael Dodge' has huge quantities of yellow berries that persist into winter. It's perfectly happy in shade. 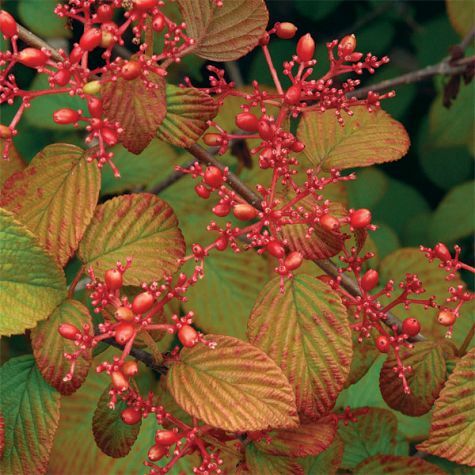 V. dilatatum 'Erie' is a smaller, rounded shrub with leaves that turn red, orange and yellow in fall. 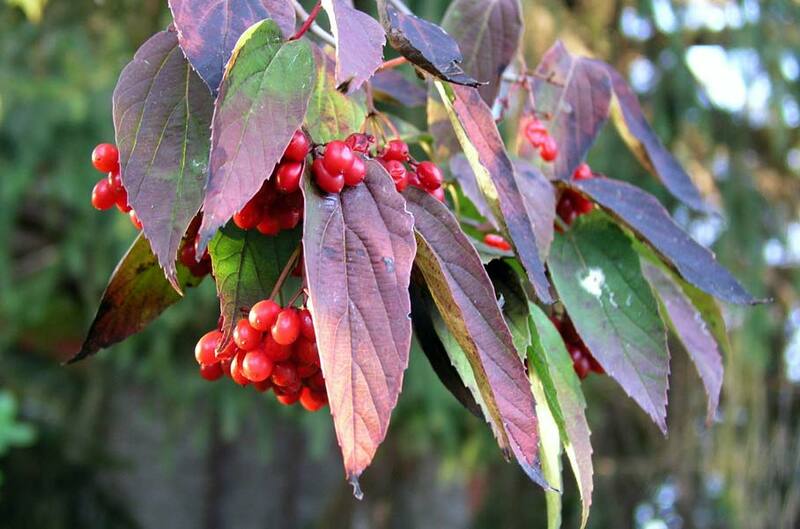 The unusual berries ripen red in summer, turn coral after the first frost, and persist as coral-pink berries throughout the winter. PHS Gold Medal Winner. Viburnum plicatum var. tomentosum (Doublefile viburnum). The horizontal branches of Doublefile viburnum put on a spectacular May show, with flat white flowers marching down both sides of the stems (not in single file, but in double file). These strongly horizontal lines give Doublefile Viburnum a distinctive silhouette. The red fruit, which develops some years in midsummer, provides another show before being eaten by birds. Viburnum plicatum v. tom. 'Copper Ridges' is a new introduction with beautiful foliage. Its leaves are full of character with conspicuous serrations and deeply impressed veins, and they often show a reddish blush in summer. The fall color is stunning: Initially copper with overtones of gold and red, it later changes to maroon. This chance seedling from the Seacrest Arboretum in Ohio appears to be a vigorous grower, reaching perhaps 6-8 feet. 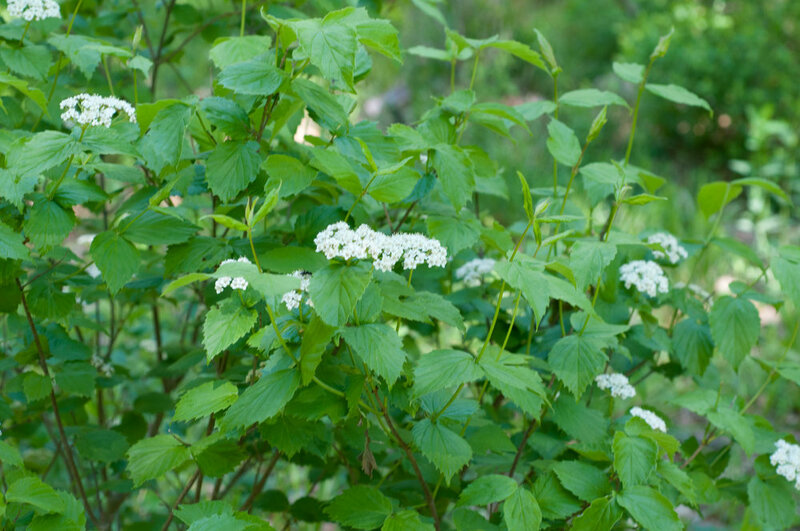 Viburnum rafinesquianum (Rafinesque Viburnum) is native to the woodlands of the East, Midwest, and into Canada - a medium-sized shrub with white flowers and glossy black berries. Supremely adaptable, it tolerates both heat and drought. While it is especially beautiful in a woodland setting, it does well in either sun or shade. Its glossy lance-shaped leaves turn a rich burgundy in fall. Viburnum setigerum (Tea Viburnum). Clusters of scarlet berries are borne so heavily that the long branches often arch down with their weight. Reaches 8-12 feet in height and is ideal for the interior of a shrub border surrounded by smaller plants. The berries start out orangey-yellow and ripen to red. And while you're at it, throw in a couple of Eastern Witchhazels! 'Mohonk Red' - Eastern Witchhazel. Yes, folks, a red-flowered Eastern Witchhhazel! Not the dark red seen on some hybrids, but a fine light red which shades to yellow at the tips of the petals. Flowers have a nice fragrance and open in mid-autumn along with the species. In his new book on Witchhazels, Chris Lane writes that there have been off-and-on sightings of red-flowered Eastern Witchhazels for over a century. This selection, discovered at the Mohonk Nature Preserve in New Paltz, NY, is probably the reddest one found so far. The shrub will grow to be about 15’ tall and 10’ wide.